The mission of the Croatian Cultural Garden Committee is to dedicate a garden that celebrates the rich cultural achievements and contributions of the Croatian people and to endow an educational legacy for future generations. 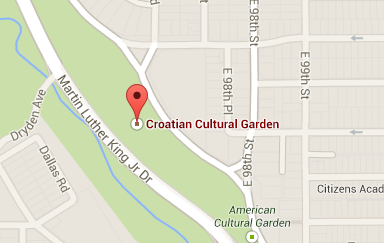 The City of Cleveland has currently designated a plot of land for the Croatian Cultural Garden on historic Martin Luther King Jr. Drive in its nationally recognized Rockefeller Park. This will be the first garden of its kind in the United States and Canada to celebrate the contributions of the Croatian people and to serve as a visible symbol of Croatia’s rich heritage. The successful completion of the garden is dependent on the contributions made by our large local and national Croatian Community and friends. DonateHelp celebrate the rich cultural achievements and contributions of the Croatian people, and endow an educational legacy for future generations.